If you experience neck or back pain, it may not necessarily be something serious, and there may be an easy solution. 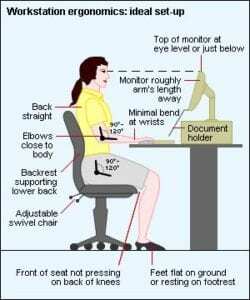 It could be the way you are sitting while you work! If you sit at a desk and work on the computer for the majority of the day, your posture and workspace layout may be causing your neck or back pain. 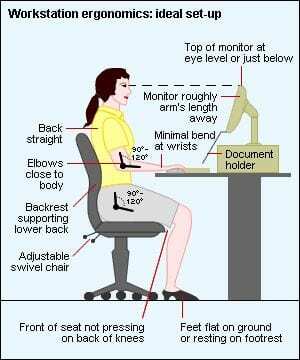 Correct ergonomics for your workspace, and proper postures are extremely important in preventing back pain that can lead to a non-accidental injury. A common misconception is that sitting on an exercise ball as opposed to the standard desk chair, or standing at a taller desk, will eliminate the risk of back pain due to improper posture. But problems can still exist proper use or posture isn’t used. Strengthening exercises can help, as can being shown proper form. Don’t overlook your workspace at home if you spend a considerable amount of time on a computer there as well! Schedule an appointment today with Makovicka Physical Therapy if back or neck pain is keeping you from your game!